Learning our new city has been one more adventure! Since we arrived in Arica we’ve been trying to figure out what life here is like. So I figured it would be a good time to share with you some of what we’ve found. The average day here in Arica is on a completely different schedule than most places. The city doesn’t really wake up until about 10:00 in the morning, then many businesses close down around 2:00 for lunch and a siesta. They then reopen at around 5:00 or 6:00 and the city is at its most active between 8:00-10:00PM. It would not at all be unusual to have someone invite you over for once between 9:00-11:00 at night. We’ve been trying to acclimate ourselves to this schedule, but the earth didn’t help us too much our first morning. We were lying in bed, trying to sleep, when we heard something rumble. Then everything shook very briefly, startling us from our slumber. At 7:00AM, sleep was no longer an option for us! The locals tell us the earth was simply trying to give us a good welcome. Still, we didn’t know what to do with ourselves being up so early, so we went out to learn our new city, and it is true. With the exception of a few breakfast places, nothing was open. We are trying to get used to this schedule. I’m proud to say that this morning we slept until 8:40; I guess it takes time, and fighting sleep as long as possible, to acclimate. We’re also trying to learn some about the new food that is around us. One day, the owner of the hotel we’re staying in invited us to have cazuela with her. We had seen it on signs in restaurants but didn’t know what it was. It turns out it is a soup, with a whole potato, a large piece of chicken, choclo (large corn), and some smaller sliced veggies. It was very good, like chicken soup with bones. 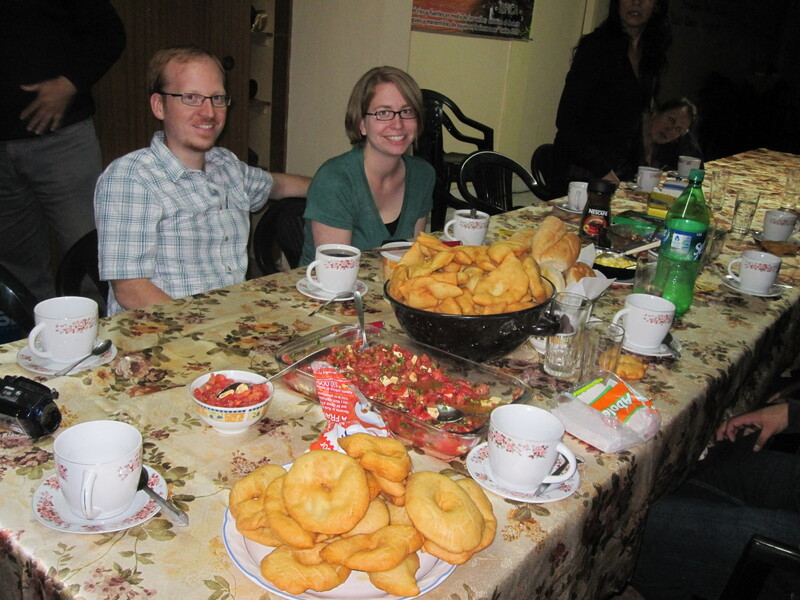 Another dish that we’ve been offered was called sopapillas, which are kind of like fried donuts, just not sweet. They were really tasty, and served with a kind of eggs, salsa, or honey, depending on which you preferred. Here we are with a large pile of sopapillas. A couple of nights ago we tried to be a little adventurous with some food choices as well. We stopped at a street vendor and bought a yogui. We asked what it was but even with the description we weren’t clear. It turns out it is kind of like a corndog. The main difference is that the hotdog is dipped in cheese, and instead of a corn batter it is more like a waffle. It was good, but a little unusual. So we followed it up with something that we are more accustomed to, chocolate cake and tres leches! Learning our new city and growing accustomed to a new diet takes some effort. A large part of our time here has been spent simply wandering around the city center, trying to take in everything that there is to see and to learn as much about this new culture as can be learned. Every day brings something new, and I can’t wait to find out what new adventures today will bring! How fun to get to try so many new dishes! Can’t wait to try them one day with you!